Rentrifone is an independent business focusing on providing Access Control Systems, CCTV Systems, Digital Satellite TV Systems, Door Entry Systems and essential repairs and maintenance services to clients in Self-Managed and RTM Blocks of flats across the M25 and in the London area. Rentrifone draws from essential experience working in areas such as Paddington, Maida Vale, Islington, Harrow, Hampstead, Camden and further afield in order to provide first class services that ensure client satisfaction. Rentrifone offers a completely free and free from obligations quotation service where they will arrange a home visit at a time best suited to the client. The property assessment will then take place, with advice given on the best CCTV System or Access Control System to suit the needs of the client. In addition to installation and maintenance services, Rentrifone provides service contracts for clients looking at on-going support and assistance in the event of an equipment failure. With contracts available from 1-5 years suited to the client, Rentrifone is qualified to provide expert advice and assistance on all major brands, including BPT, Videx, Bosch, Samsung and more. As official registered members of the British Safety Council, Rentrifone is also listed with Professional Security Magazine, giving clients total peace of mind in their expert approach to service and repair of home security systems. 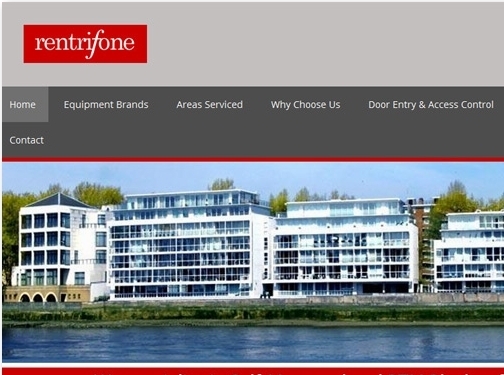 Whether you require assistance in upgrading your current system, or you would like to arrange a home visit to determine the best Door Entry System for your block of flats, the Rentrifone team are more than happy to help. UK (London) based business - with over 25 years’ experience - providing Digital Satellite Systems, CCTV Systems, Door Entry Systems and Access Control Systems. Website includes details of services provided, testimonials, blog, associations, full contact details including company registration and VAT numbers.